Carmana Sintav is the Imperial wife of Cyronin Sintav of clan Sintav in the Imperial City's Elven Gardens District. Cyronin recently had a clash with Helvo Atius from the nearby Talos Plaza District that has caused bad blood between the Sintav and Atius clans. Carmana wakes up every morning at 6am. She wanders around on the main floor of her house until 11am, when she heads to the King and Queen Tavern for lunch until 1pm. She then heads back home. At 3pm on Morndas, Middas and Fredas, she heads out to go and visit Jastia Sintav until 8pm, when she heads home again to wander until her bedtime at 10pm. On Tirdas, Turdas and Loredas, she spends that time at home, eating from 6pm to 8pm on her main floor. On Sundas, she diverges altogether and heads to visit her Uncle Iniel Sintav from 9am to 9pm. The only exception to this is during the Light the Dragonfires quest, when the whole Imperial City is under martial law. Carmana wears light brown linens, a quilted doublet and thick cowhide shoes. She also carries around a small amount of gold and her house key. The first time you speak with her and 20% of the time thereafter, she will say, "I'm Carmana Sintav. Cyronin is my husband. Excuse him, please. He's a little irritable." 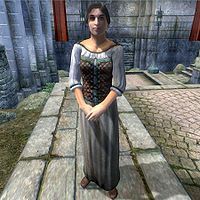 When asked about the Imperial City, she will tell you, "Things have been very quiet with the Atius. That suits me just fine. All this fighting is stupid. What are they fighting about? Just stupid pride." Esta página foi modificada pela última vez à(s) 22h45min de 13 de agosto de 2013.